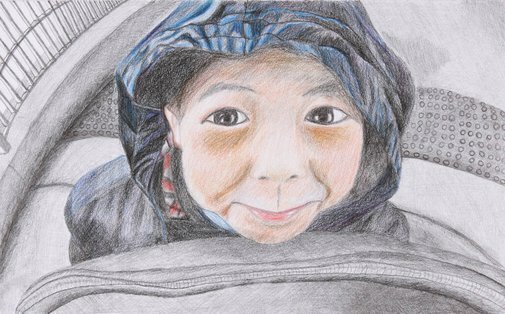 I have chosen to depict Richard, my little brother in my portrait. He is a very inquisitive and playful nine year old. He loves reading books, doing scientific experiments, drawing, playing tennis etc. He lives in China with my dad and I miss him very much. He taught me how to be a great role model. He is wonderful to be around although sometimes he gets a bit naughty. In this drawing, he is at the border between the mainland and Hong Kong. He is waiting in the line, leaning on his suitcase and making a funny face at the camera.